Bringing the new brand for Dr. Brian Price, former owner of In The Game, into the fold, 2017 President's Choice Blue and White Centennial Hockey ushers in a new era of limited releases in the ITG mindset. 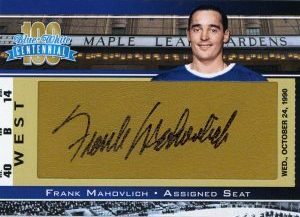 Every box of the Toronto Maple Leafs retrospective contains three relics and seven autographs. 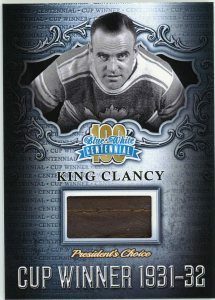 Honoring a century of the Maple Leafs, the base set includes 50 cards, each numbered to 100 copies. Collectors can also take advantage of a five-box case incentive which yields a full 50-card set, all featuring the same serial numbering. 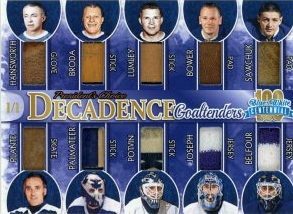 Other than the base, 2017 President's Choice Blue and White Centennial Hockey is loaded with Toronto-based hits. Signed inserts include Assigned Seat (1 per box) for 25 players with Green/Gray (#/5), Blue (#/4) and Gold/Red (#/3) versions. 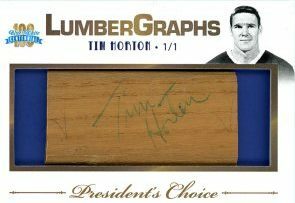 These cards feature autographed seat pieces from Maple Leaf Gardens. LumberGraphs and Vintage Papercuts are other signed choices. 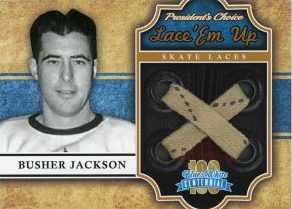 Among the game-used memorabilia options, all numbered to ten or less, are Decadence Goaltenders, Enshrined, King Clancy Cup Winner, Lace 'Em Up Skate Laces and Stickrack inserts. Of particular note is Enshrined, which displays the player's image and name covered by a piece of glass. 2017 President's Choice Blue and White Centennial Hockey is a small release with just 500 numbered boxes, or 100 cases, in all. 34 subjects. 6 per box. PARALLEL CARDS: Gray #/5, Green #/5, Blue #/4, Gold #/3, Red #/3. Watched a pair of box breaks recently and this is unbelievably impressive. 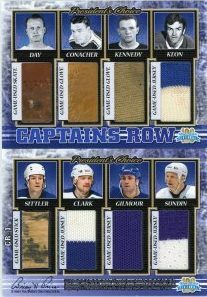 From the widely known to the obscure, this set covers the Leafs very nicely over the last 100 years. The price point is very high so I recommend group breaks (if there are any left). I did and couldn’t be happier. For $25 I ended up with an Ian Turnbull paper cut auto and $55 got me an Assigned Seat autograph of Ed Chadwick. On top of that, I asked for and got the box serial #’d 401/500 (for those who don’t know, highway 401 is a major highway that runs through Toronto). Highly recommend for those with deep (blue) pockets, if there are any left. From an Oiler fan.